Just when we thought we had tried every e-juice flavor imaginable, the manufacturers at Gemini Vapors™ created a unique flavor that we can’t stop vaping. 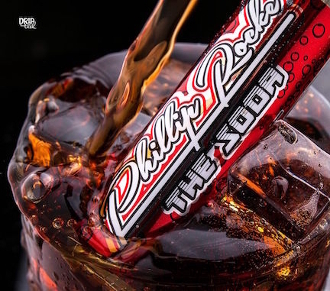 THE SODA by Phillip Rocke is a crazy blend of premium ingredients that taste just like your favorite dark soda beverage and soda flavored tart candy. We know, what you’re thinking; “what a wild idea for an e-liquid flavor, is it any good?” To answer your question, yes, it’s incredible. Phillip Rocke is a well-known mixologist and e-juice creator that is praised for his lines of delicious e-liquids as well as being featured in the creation of individual e-juice for other brands. Upon inhale you taste the unique blend of flavors with sugary undertones to create an awesome taste that lasts through the exhale. The Soda by Phillip Rocke is a very genuine e-liquid that tastes just like the real thing. The throat hit for The Soda made by Philip Rocke is awesome, very mellow and not in any way harsh. It is an e-liquid that is refreshing, cool, calm and collected. The Soda by Phillip Rocke comes in a max VG blend, mixed at 80%/20% VG/PG. This means not only does this e-juice blow fat clouds, but it also holds its flavor well. It’s an e-liquid composed with high grade all natural ingredients for perfect taste. The Soda by Philip Rocke comes in an awesome glass e-juice bottle, wrapped in a shiny red label. The-liquid bottle is long and skinny rather than the traditional short a fat style. The label has little fizz bubbles on it, topped with Phillip Rocke’s signature, with the e-juice name “THE SODA” printed under it. The e-Liquid is produced in 0MG, 3MG, and 6MG nicotine levels and in 30ML bottles with glass dropper tops for your vaping pleasure. This stuff is incredible and is a one-of-a-kind flavor that is sure to change your day around.